Don’t miss out on this great sale on Annual catalog items starting on Black Friday. Please see the flyer above. There will be two day sales for three categories of products. Don’t forget there are holiday products in the annual catalog, as well as some that might be on your wish list. This week’s card uses several layers but the stamping is simple (#simplestamping). Here is a picture of the catalog card and my card. 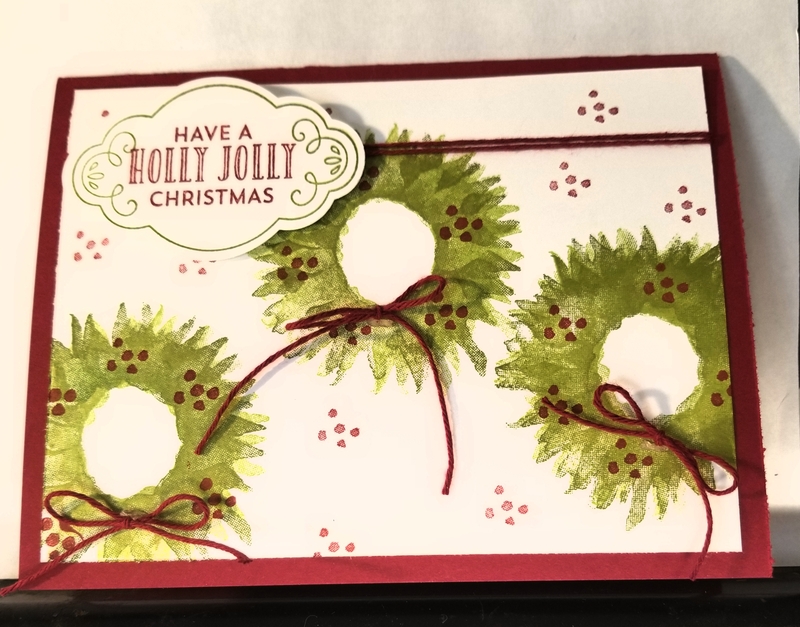 I used the Illuminated Christmas stamp set in the Holiday Catalog. I embossed a layer of Night of Navy card stock and mounted on a card base of the same color. Next I made a banner out of some yellow with design designer series paper and then a white layer with the stamped images. I used vellum for the greeting and added a navy twine bow, metallic silver thread and some rhinestones. I finished the inside as well with stamps from the same set. All products are Stampin Up. If you are interested in purchasing any of these products, please go to my store at darleneseitz.stampinup.net. please use current host code of PQEUH7HT (for orders less than $150.) and receive a free gift from me. Thank you and happy stamping. Not only is it caseing Tuesday but it is the day before the 2018 Holiday catalog goes live. Yeah. Therefore, I have chosen to use a new Bundle from the catalog for this week’s CASE. The original card is found on page 38 of the Holiday catalog. That card and mine are shown below. The Bundle I used is Cauldron Bubble which includes the stamp set and dies. I just used the stamp set, plus some accessories from the Suite, Toil & Trouble. Accessories include Basic Black blends, Black Glittered Organdy Ribbon and Spider Trinkets. This suite is found on page 48 & 49 of the H.C. I also used the Buffalo Check background stamp found on page 38 of the H. C. In addition to the above, Mango Melody, and black ink and Mango Melody and Gorgeous Grape, Whisper White paper along with coordinating blends and markers. I hope this card will inspire you to start your crafting for the holidays. If you need a catalog, please leave a comment. To purchase products, please use this link to my online store darleneseitz.stampinup.net. The current Host code is HYYPVVUB. Please use on your order to get a free gift from me. I hope you all had a great Christmas. Here is this week’s CASEing Tuesday Card. It is based on the card shown on page 4 of the Holiday catalog. I made some changes in the colors and arrangement of the trees and banner but the design is basically the same. 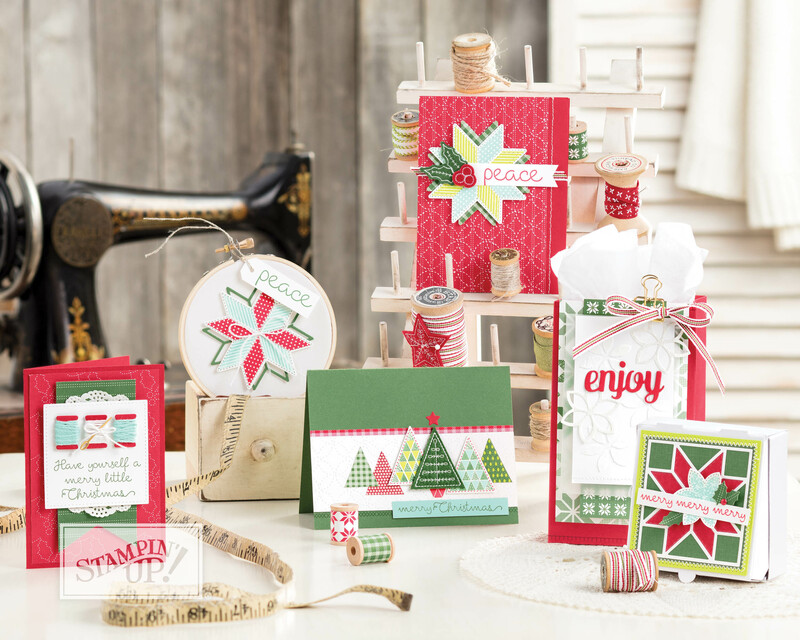 The cards use the Bundle Christmas Quilt and several of the accessories shown on page 5 of the Holiday catalog. They are: Stitched Felt Embellishments, Quilt Top Textured Impressions Embossing Folder and the Quilted Christmas Designer Series Paper. This is a great set that can be used all year long. It is still available in my on-line store darleneseitz.stampinup.net. Here is this weeks card. It is based off the card shown in the annual catalog on page 223 (top right corner). I stayed pretty true to the design. 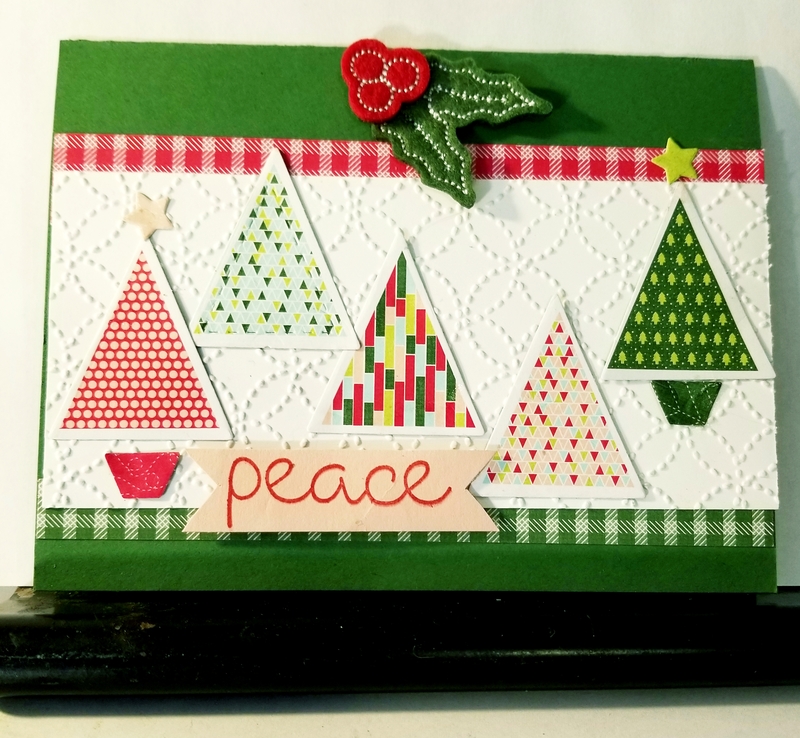 I used an old retired set but this could easily be made with the Good Tidings set still available from Stampin Up. I also used the two largest dies from the Lots of Labels framelits. I can’t seem to stop making Christmas cards. Don’t forget to check out the retiring list and discounted items in my on-line store. Also, the Clearance rack has been updated with new items. Here is the link to my on-line store darleneseitz.stampinup.net. Here is this weeks CASEing Tuesday Card. I have used the Painted Harvest set and made the flowers into wreaths. I used both flower stamps and used Lemon Lime Twist and Old Olive as the color combinations. Each wreath was stamped a little different using different layer combinations and color. I also used Cherry Cobbler and the dot stamp that comes with the set as well as for the greeting wording. I added small bows using twine. The design was from the card in the Holiday Catalog on page 48, bottom left. Here is the picture. There is still time to shop from the Holiday Catalog. This set will not be retiring when the catalog sales period ends on January 2, 2018. However don’t wait to order as it is a very versatile set that can be used all year long. The link to my on-line store is darleneseitz.stampinup.net. Also, the retiring items from the catalog (holiday) have been announced AND many are currently on sale. Don’t miss out on these year end specials. See my on-line store for details under Store. 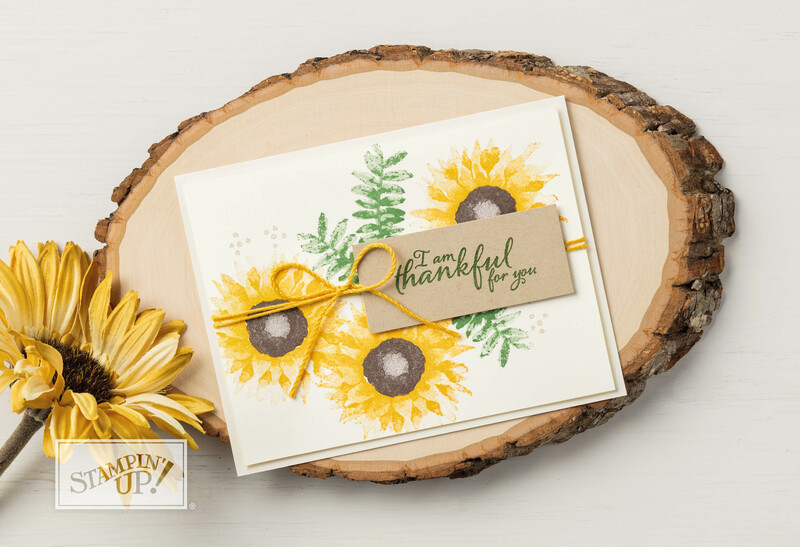 darleneseitz.stampinup.net. Have a great week and Happy Crafting. P.S. please use the Hostess Code which is YGVZSKCA if you place an order and you will receive a free gift.